*Redesignated Office of the Chief of Military History, 28 March 1950. **Succeeded by Col. Thomas J. Sands, 3 March 1950. Order of Battle OB WEST, 6 June 1944. Allied Assault Routes, 6 June 1944. The Airborne Assault, 6 June 1944. 101st Airborne Division Drop Pattern, 6 June 1944. 82d Airborne Division Drop Pattern, 6 June 1944. The Second British Army on D Day. German Countermeasures, 6 June 1944. V Corps, 7-8 June 1944. VII Corps on D + 1. Battle for Carentan and Junction of the Beachheads, 8-12 June 1944. V Corps Advance, 9-13 June 1944. Kampfgruppe Heintz, 6-11 June 1944. Toward St. Lô, 14-18 June 1944. Securing the North Flank, 8-14 June 1944. Attack to Cut the Peninsula, 10-18 June 1944. The Advance North, 19-21 June 1944. The Attack on Cherbourg, 22-26 June 1944. The Advance Inland, 6 June-1 July 1944. 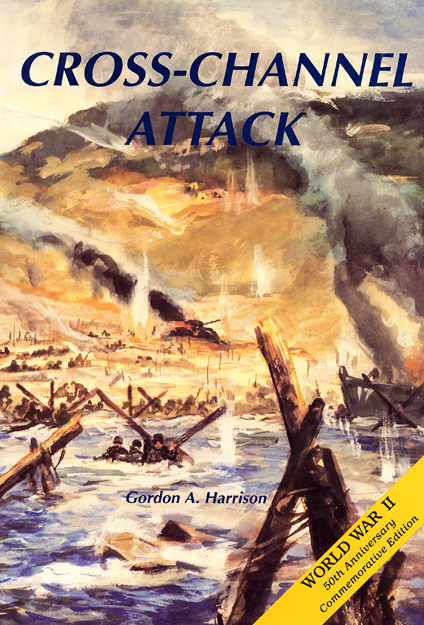 Cross-Channel Attack is one of approximately a hundred volumes which the Department of the Army intends to publish regarding its part in World War II. This particular volume deals with the planning and the difficulties encountered incident to the mounting of the largest amphibious assault ever undertaken in military history. Much of the information it contains has not heretofore been a matter of public knowledge. For example, light is for the first time thrown upon the enemy's conflicting theories of defense against Allied air superiority and upon his paucity of first-class troops. This information is derived from the official records of the Wehrmacht and from signed statements of German participants. Many of the difficulties encountered in the planning, as well as in the execution stage of the operation, are here described to the public for the first time. Where this history deals with the struggle ashore, it clearly illustrates the necessity for commanders to adjust their thinking to the means at hand, the terrain, and the influence of new weapons. It reiterates the indispensability of constant training in how to get order out of the confusion which is forever present upon the battlefield. It brings to mind in this connection the means used by a football team for meeting the problems of overcoming opposition on the playing field. The plays devised and the techniques used to attain its ends must be practiced again and again. Frequently it is the loss of effective direction of small units, incident to the battle's toll, which makes for failure rather than success. Whether the reader approaches the book with the justified pride that he was a member or supporter of the winning team, or whether he reads to learn, is a matter for him to decide. The victor tends to prepare to win the next war with the same means and methods with which he won the last. He forgets the difficulty of reaching decisions, the planning problems, his faltering, his unpreparedness. The vanquished is wont to search far afield for new and improved methods, means, and equipment. The accomplishments of those who fought in this period were indeed great, as were the sacrifices. But from the national viewpoint it would seem desirable to read this volume with the self-critical eye of the vanquished as well as with the pride of the victor, an approach which the thoughtful reader will not find difficult. Chronologically this volume is first in the series narrating the events of World War II in the European Theater of Operations. It has been preceded in publication by The Lorraine Campaign, which covers the operations of the Third Army during the autumn of 1944 and which begins some two months after the close of the present volume. A co-operative history of the type represented in this series has distinct advantages but does not lend itself readily to the production and publication of volumes in proper chronological order. For this reason each volume will be designated only by title and will remain unnumbered. Cross-Channel Attack has been planned and written as the introduction to the history of those campaigns in 1944 and 1945 which led to the destruction of the German armies in the west. It provides necessary background for the study of all the campaigns in the European Theater of Operations. The narrative of operations ends on 1 July 1944, with the Allies firmly established in Normandy. The concluding chapters show the successful fruition of plans and preparations reaching back as far as January 1942; but the seizure of the Norman beaches and the establishment of a lodgment area are only a beginning, a point of departure for the drive to the Elbe and the Baltic. Although Cross-Channel Attack includes discussion of certain problems of high command and logistics, a more complete treatment is accorded these subjects in two volumes now under preparation in this series: The Supreme Command and Logistical Support of the Armies. The author of Cross-Channel Attack, Gordon A. Harrison, a former newspaper reporter and instructor at Harvard University, holds the Doctor of Philosophy degree from that institution. During the war he served as a historical officer with the Third Army, taking part in five campaigns. He joined the Historical Division, Department of the Army, in 1946. This volume, introductory to a series on the European Theater of Operations, deals with the development of strategy and planning for the attack on northwest Europe in 1944 and with the first month of operations establishing Allied armies in France. The first seven chapters (about two-thirds) of the book are concerned with the prelude to the 6 June assault: the preparations and discussions of strategy on both the Allied and German sides from 1941 to 1944. The remaining three chapters describe the combat operations of the First U. S. Army in Normandy from 6 June to 1 July 1944. This apportionment of space was deliberately made with reference to the whole European Theater Series, and much of the material on plans, the state of German defense, preparatory operations, has strict relevance only when viewed from the larger perspective. While attempting to set operations in northwest Europe in the framework of world-wide strategy, Cross-Channel Attack makes no pretense of telling the full story of that strategy. Other volumes under preparation by the Historical Division will focus on the Mediterranean and Pacific and discuss various aspects of the higher direction of the war. It should be pointed out further that this is an American story of an Allied operation. It is based largely on Department of the Army records, and although these include a large number of British and Combined documents it has not been possible, nor was it intended, to develop in full the narrative of British participation. Every effort has been made to avoid a partisan viewpoint and to present fairly some of the critical problems of the Anglo-American alliance as they came into and were revealed by the cross-Channel project. Beyond that there is no attempt to achieve an "Allied" perspective or to weigh and balance American and British contributions. In the operational chapters British action has been summarized only when it occurred on the flank of First U. S. Army and materially affected American operations. In the narrative of American operations in Chapters VIII-X, the basic unit treated is the division, although in recording the fragmented battles typical of fighting in the European theater it often becomes necessary to follow battalions and even companies and platoons on quasi-independent missions in order to describe fully what the division as a unit did. The actions are described in somewhat less detail than in other volumes of the series chiefly because the Department of the Army has already published monographs covering the period. The reader interested in greater detail will find it in [Charles H. Taylor] Omaha Beachhead (Washington, 1945) and [R. G. Ruppenthal] Utah Beach to Cherbourg (Washington, 1947). Cross-Channel Attack summarizes these two accounts with occasional corrections, additions, and reinterpretations, and with entirely new German material. In a work based on thousands of cables, memoranda, plans, journal entries, etc., to have cited the source for every fact would have unduly burdened every page with redundant footnotes. Documentation is therefore selective, aimed first at citing authorities for all important or disputed facts and opinions, and second at providing those curious to know more with an adequate guide to the primary and secondary source material. As is the uniform practice throughout this series, German units and headquarters are italicized. Exception is made for OKW and OKH which, though military headquarters, were also constitutional organs of the German state. German units are translated whenever exact English equivalents exist. The terms panzer, panzer grenadier, Luftwaffe, and Kampfgruppe, however, have been retained because they are of such common occurrence that they have been virtually assimilated at least into military English. Cross-Channel Attack is in a real sense the product of co-operative enterprise. It depends heavily on information collected by army historians in the field during combat, on preliminary draft narratives by other historians after combat, on specific assistance given me during the writing and research, and perhaps most important of all on the privilege (which I have always enjoyed) of tapping the collective knowledge of colleagues working in related fields. When the first draft was completed I had to leave the Division temporarily and the whole burden of editing devolved for some time upon others. I am particularly grateful to Associate Editor Joseph R. Friedman and to Capt. Frank Mahin, Capt. James Scoggin, and Mr. Detmar Finke of the Foreign Studies Section for undertaking much of the onerous burden of checking facts and footnotes in my absence, and for performing an editing task that often amounted to collaboration. It is a pleasure to acknowledge indebtedness to Col. S. L. A. Marshall for his indispensable series of interviews and manuscript studies of the airborne operations in Normandy and for his interviews with officers and men of the 1st and 29th Divisions. Other combat interviews to which I am indebted were conducted by Lt. Col. W. T. Gayle and Capt. R. G. Ruppenthal. Special thanks are due Captain Ruppenthal and Colonel Taylor for the excellent preliminary studies on UTAH and OMAHA beach mentioned above which I have used freely. Interviews conducted by Dr. Forrest C. Pogue with some forty British planners and commanders in the summer of 1946 immeasurably enriched the record available to me. cially grateful to Mr. Israel Wice and his assistants, to Mr. Royce L. Thompson, and to Miss Alice Miller. The problems of dealing with an Allied operation largely from American records were greatly reduced by the generous help of the British Cabinet Historical Section under Brigadier H. B. Latham. I must particularly acknowledge the contributions of Lt. Col. H. A. Pollock and Lt. Col. A. E. Warhurst. Colonel Warhurst, author of the British Historical Section's preliminary narrative of operations in northwest Europe, has sent me copies of important documents missing from the files here and has supplied careful briefs of British action. Useful information was also supplied by the British Admiralty and the Air Ministry. Col. C. P. Stacey of the Canadian Historical Section gave me the benefit of his special knowledge. It should be pointed out, however, that the British and Canadian historians do not concur in many of the judgments in this book and that they are in no way responsible for the handling of the material, or for errors of fact or presentation. For making available personal papers and other data I am indebted to the kindness of Gen. Dwight D. Eisenhower, Maj. Gen. Ray W. Barker, and Lt. Gen. Sir Frederick E. Morgan. Other commanders have helped clarify obscure points and have criticized portions of the manuscript. Footnotes acknowledge their contributions only in part. The warning must be repeated that their help in no way implies an endorsement of the use that has been made of it. Mr. Wsevolod Aglaimoff in the course of planning and laying out the maps provided me with new fruitful perspectives out of his knowledge and experience as a military cartographer. Pictures were selected and prepared by Lt. Col. John Hatlem; aerial photographs were made by him specially for this volume through the co-operation of the 45th Reconnaissance Squadron, USAF. Miss Michael Burdett edited the footnotes and, with Mrs. Frances T. Fritz, copy-edited the entire manuscript. The tremendous job of preparing the index was carried out by Mr. David Jaffe. Miss Mildred Bucan typed the manuscript for the printer. Cross-Channel Attack has been prepared under the general direction of Dr. Hugh M. Cole, Chief of the European Section, Historical Division. It has been a happy and rewarding experience to have had Dr. Cole's discerning counsel throughout the period of research and writing.